Most Christian commentary on caring for the environment leaves me completely cold. I just can’t seem to muster up the motivation that other people have to ‘live sustainably’. There, I said it out loud. Caring for the environment leaves me completely cold. I just can’t seem to muster up the motivation. There, I said it out loud. The topic often makes me feel enormously guilty for my pathetic failures—I keep forgetting my Keep Cup and reusable bags, I haven’t done enough research into what products I buy that have microbeads ruining the oceans, and yes I know I shouldn’t duck to the shops in my petrol guzzling car to pick up dinner (that probably comes in too much plastic packaging) but I excuse myself by claiming that I just don’t have enough time to do better because I’m a busy mum who is just trying to get through the day. Too much mental load, people! Am I the only one who feels like this? I suspect not. There are many different ways that people try and motivate others to care for the environment. Guilt crushing burdening, self righteous virtue signalling, judgmental finger pointing, and fear inducing end times hysteria are common methods. And what is frustrating is that many Christians seem to employ those exact same methods! After one particularly annoying ‘Christian’ talk on caring for the environment with no mention of Jesus which left me and the audience feeling completely guilty and burdened, I was so worked up that I decided to write a book about the topic. Then I discovered Is God Green? by Lionel Windsor. Lionel has heaps more street cred than me, having been an engineer in solar cell research, and now a lecturer in New Testament at Moore College, so I’m pleased, for everyone’s sake, that this is the book that got published. Is God Green? is a very short book (60+ pages) which started off as a set of talks to University students. It is clear and simple, with a straight forward look at the topic of the environment through the lens of Biblical Theology. In 6 short chapters he looks at creation in the beginning, the fall, the cross, the future and what to do while we wait for the end of the world. Finally, here’s a book that shows how the gospel changes people, which can then, in turn, make a difference to the world and its environmental problems. Finally, here’s a book that handles the Bible well on this issue, and shows how the whole of God’s salvation plan relates to care for the environment. Finally, here’s a book that manages to talk about the environment without pandering to guilt or self righteousness. What a breath of fresh air. Windsor’s thesis is that, when we submit to Jesus, he restores us to our rightful place as God’s image bearers who rule to world under him (p 42). As Christians we put off the old self, and put on the new (Colossians 3:5-10) which means we will put off greed and selfishness, and put on love and service. This will therefore have an impact on all the decisions we make that impact the environment. Those familiar with the Two Ways to Live Gospel outline will recognise much of the language Windsor uses (God being our ruler, and God giving us responsibility to rule the world under him). If I had to give one tiny criticism, this language tends to make the book a touch predictable. But maybe that’s just me. Is God Green? 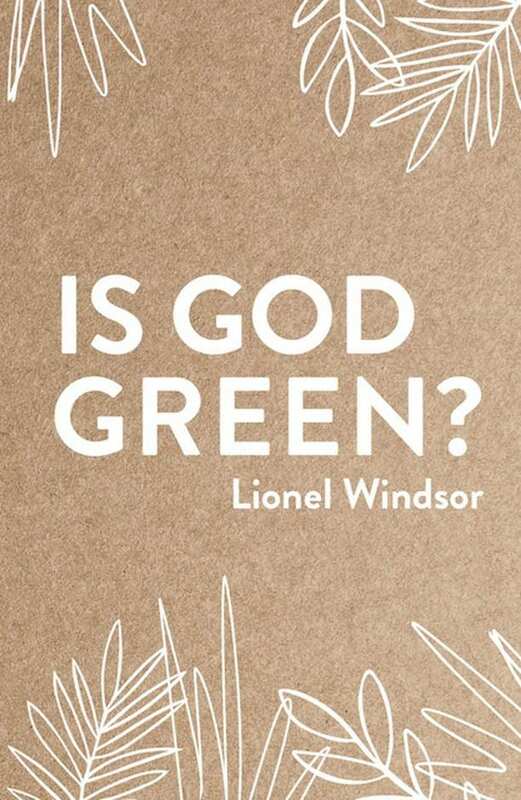 would be a great book to give to young Christians, or confused Christians or enquiring non Christians with an interest in the environment. I’ve bought a stack of copies to give away. Or maybe it’s better to buy it in e-book format—saves paper. One thing’s for sure, it’s definitely a book with a message that our world needs. Michelle Underwood is a Biblical Studies teacher at Thornlie Christian College. She lives in Perth with her husband Ben and two children, and attends St Matthews Anglican Church, Shenton Park. She hates gardening and doesn’t compost, but she loves coffee and now owns a Keep Cup.